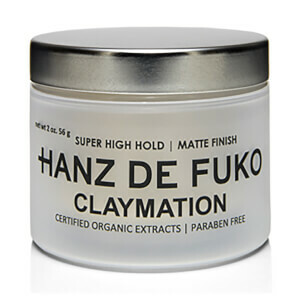 Experience the ultimate in hair styling with Hanz de Fuko Claymation, a super high hold hair clay with matte finish. Innovative and edgy, the texturising hybrid combines a pinch of 'Quicksand' for the perfect 'clay-wax' formula. High performance and fortified with a synergy of natural waxes, the pliable clay allows you to achieve perfect pompadours and chilled out coifs every day. - K.N. Best product for my hair.. 7cm and longer.. Really looks amazing in my dark brown hair. I am very happy with this product. I have very thick hair, very demanding when it comes to styling, very hard to style to be precise but Claymation really works for me. It gots nice hold, firm but flexible so my hair stays at place but doesn't have that cement hair spray look. I would recommend this product any time! Every since I started to style my hair with not generic products, I started with this and it was awesome. Somehow I managed to forget this product for few years and now I understand why it was sooo good. 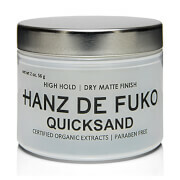 Easy to worm up and goes into the hair without much problem, but it has strong styling properties. It is perfect for heavy hair! Even without preping your hair you can get a good hairstyle which will last with this product. Have a hair which is hard to manage, want your hair to look natural bit still with great control - look no further! amazing product and very pleased with the whole service!!! Perfect as a prestyler and also perfect for just styling your hair! This clay is fantastic. Really struggled to find a replacement for Kevin Murphy’s gritty business but this is much better in my opinion. A much better matte finish. I think this product is overrated. The hold is good, it has really 100% matte finish, but I don't like it at all. The feeling when you wear it is OK. Definitely not greasy. You don't have a feeling of dirty hair, but once you try to wash it out it is really difficult to clean. You feel that your hair is not clean enough after 2 days of wash it two or three times each time. I don't recommend it unless you buy also a special clean shampoo. Not the best hold, but suit works for me. Good texture. Easy to use. Gives a natural matte appearance. Really love this Clay. Needs to be warmed up in the hands before applying to the hair or you won’t get the best out of it. Best hair product around at the moment by far. This hair product is great! I have fine hair and this product creates volume, matt shine and and extra strong hold that lasts all day. Probably the best styling product I have ever used. So far and hands down the best finishing hair product I've ever used. No strong smell, easy to apply, lasts the day, leaves hair reworkable and pliable, as simple as that. Thanks Mankind for the great service on this site with all the recommendations. Absolutely love this product,holds really well and washes out easy. Gona try the pomade and quicksand next. This has to be the best hair product around. Been using it for a few years and it's way better than what I use to use before. 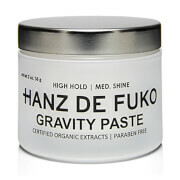 Excellent hold which keeps you're hair in place all day. Well recommended. Unreal product,never tried anything like this. Well recommended,only thing I don't like it's a small tub but you don't need a lot of it to put into you're hair.